Today I’m going to teach you How to Cook Pot Roast in the Instant Pot! No more planning for hours ahead to enjoy a juicy, fork- tender pot roast. Pot Roast may become a weeknight tradition! Don’t get me wrong, my beloved slow cooker still has its place, but I’m in love with the Instant Pot! The Instant Pot is able to achieve the same tender and juicy meats we al love in often less than half of cooking time of a slow cooker. The process of high heat along with high pressure creates a pot roast like grandma used to make in her old fashioned pressure cooker. 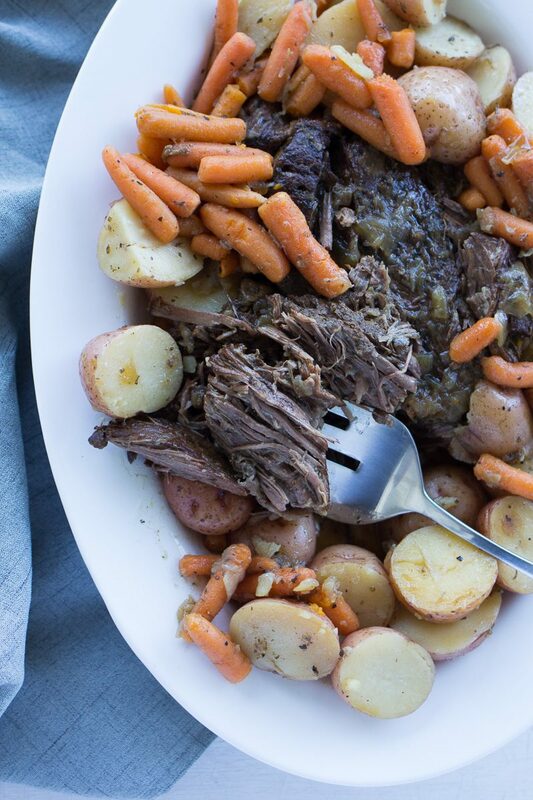 Once you learn How to Cook Pot Roast in the Instant Pot, you’ll never go back. Your time is valuable and I know dinner is a dilemma we all face. We want to provide our families with healthy and delicious meals, but we don’t have time to prepare. Often, I forget until 4-5:00 to think about what’s for dinner. In the past, all of the low and slow cooked meals my family loved were off limits unless I was super organized and remembered to get food into a slow cooker by noon at the latest. Instant Pot to the rescue. Learning How to Cook Pot Roast in the Instant Pot is money in the bank. I promise you will thank me later! 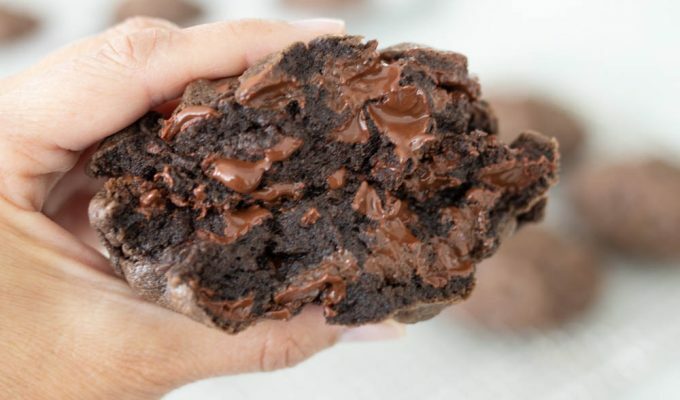 This Instant Pot recipe is full of flavor in every bite. I season the meat with a simple seasoning mixture of salt and pepper. The real flavor makers are the Worcestershire sauce, Balsamic vinegar and fresh garlic and onions. These ingredients combined, help make the dish more appealing in color and flavor. As I discussed in my Instant Pot Beef Stew recipe, Worcestershire is a sauce I keep in my kitchen at all times. It is filled with all kinds of goodies that add an extra boost of flavor to meats and sauces. 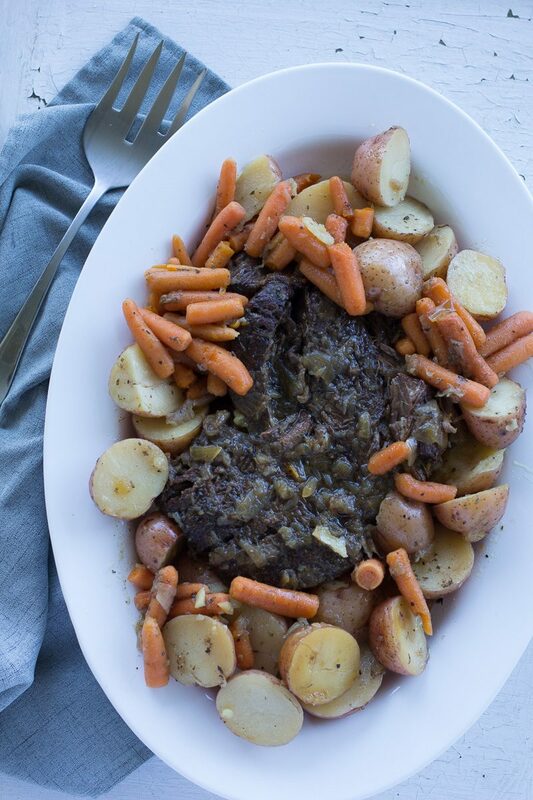 Worcestershire is key when learning How to Cook Pot Roast in the Instant Pot! Once you learn How to Cook Pot Roast in the Instant Pot, dry roasts will be a thing of the past. It is nearly impossible to dry a roast out using the Instant Pot! The combination of high pressure and heat locks the moisture inside of the meat, instead of letting it evaporate over hours.The high pressure also tenderizes the meat in a short period of time. The onion will also give off a bit of liquid, which contributes to the liquid left in the pot after the pressure cooking is finished. If you’re wondering how your neighbor is making great meals and why your kid wants to eat dinner at their house every night, they probably have an Instant Pot! Hahaha. Ok, maybe not, but just saying. Maybe they do. 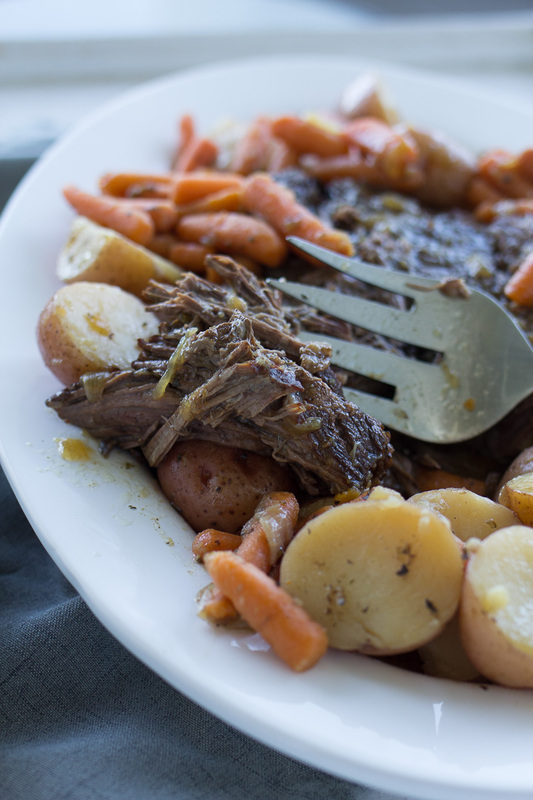 Now to lure your family back to the table for dinner, even when it’s not Sunday, surprise them by learning How to Cook Pot Roast in the Instant Pot and serving it on a Wednesday night. Wouldn’t that be a picture worthy post? Family reaction to a real meal mid week! Seriously though, no matter the day of the week, everyone will love this dish. Pot Roast has always been a first Sunday of the month go-to meal for us. In our church, we have a practice of fasting every first Sunday of the month. We pray specifically for people in need and then donate a fast offering for the meals we have skipped to help meet others needs. By dinner time Sunday, everyone is HUNGRY! Hence the Pot Roast tradition. I usually serve it with homemade rolls, green salad, fresh fruit, corn and of course, a really yummy dessert! There is not a dinner dish that is more satisfying and simple than pot roast. 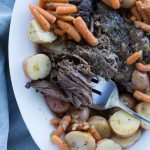 Once you learn How to Cook Pot Roast in the Instant Pot you will almost feel a little guilty when everyone gushes over dinner! Almost. This recipe is broken into three simple steps. Brown the meat. Cook the meat. Add the rest of the veggies cook for a few more minutes. Dinner is served. You can skip the step listed in the recipe for making the thickened gravy if you simply want to serve the roast with its natural juices. Oh, and for a second dinner, if (that’s a big IF) you have any leftovers, the pot roast makes an amazing sandwich for dinner the next night on a french roll! I often cook two roasts at once for this reason. If you cook two roasts, keep the same cooking time, just add additional veggies and broth. Have I convinced you to cook your next roast in the Instant Pot?? I hope so! 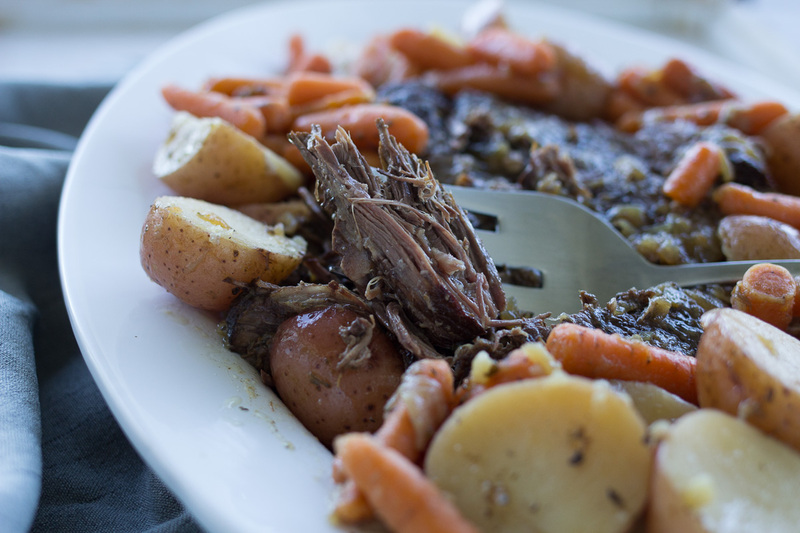 I’d love to know what variations you use for your family favorite pot roast! For basic Instant Pot information, check out this post- Instant Pot Now What? which also links to several favorite ABK Instant Pot recipes. Generously season the roast with salt and pepper on both sides. Pour olive oil into heated pot. Place the roast into the heated instant pot and sear on both sides, about 2 minutes each side. Sprinkle the Worcestershire sauce and Balsamic vinegar on the top of the roast after browning. Add onions and garlic to the Instant Pot, let some of the onions go to the side of the roast and some resting on top. Pour 1/2 cup beef broth or water around the sides of the meat and turn the Saute mode OFF. Place the lid of the Instant Pot on and turn the dial to the sealing position. Make sure the rubber seal is in place inside of the lid. Turn the Instant Pot to the Meat or Manual setting for 45 minutes using the + button until the time displayed is 45 minutes. Press start. I like to place my IP on top of the stove on a cookie sheet so it will vent thru the venting hood on my range. While the meat is cooking, prepare the potatoes and carrots. Set aside. Mix one half cup beef broth or cold water in a cup with 2 tablespoons flour using whisk until smooth. When Instant Pot is done, the timer will sound. Leave the meat in the pot for another 30-45 minutes so the pressure in the pot is naturally released. After 30-45 minutes, most of the pressure should be naturally released. If pressure is remaining, let it vent naturally. It is best to allow a roast to naturally release steam for best results and most tender meat. When all of the pressure is released, remove the lid. The meat should be fork tender. If it is not, the manual setting may be used again for an additional 5-20 minutes. You can gauge how tender the meat is by pulling it apart. Again, it is always best to allow the pressure to naturally release and not manually be released form the pot. Add the potatoes and carrots to the Instant Pot. Turn the Instant Pot to Manual setting and adjust the time using the + or - button. Set to cook for 5 minutes. Make sure to set the dial on the lid to the sealing position again! When the timer goes off, carefully release the pressure using the venting position. When ready to eat, Remove the roast to a platter or bowl, Spoon the veggies around the roast. To make gravy, Turn the Instant Pot to the saute setting. Wait until the broth is bubbling, and add the flour and cold water mixture to the Instant Pot, whisking while adding. Add the Knorr concentrated stock and whisk. Cook for about one minute until gravy is thickened and bubbly, or simply serve the roast with the juices from the meat and veggies. Add salt and pepper to taste. I will be adding to my instant pot recipes soon! Once you get the timing down with the meat and veggies, dinner is done and it all tastes wonderful. check out my other IP recipes, such as chili verde or beef stew. Have you seen my post Instant Pot, Now What? for cooking tips? I made this on Saturday and it turned out amazingly awesome! It was my first time using my Instant Pot so I had some issues figuring out the timer, remembering to wait for it to heat up before assuming it was cooking, etc. (that was the most interesting thing about the process – how quiet the Instant Pot is!) But your directions were so easy to follow, the ingredients were all readily available and the flavors were perfect. I was also blown away that the veggies were so perfectly cooked after only being in there such a short time. The potatoes and carrots weren’t mushy and I was so thrilled by that! I can’t wait to make this again – thank you for writing a recipe that helped me to be brave enough to finally use my 6 month old Instant Pot!!! I love to hear Instant pot success stories! This sounds AMAZING! I’m going to try this next Sunday! I’m just beginning my foray into Instant Pot Cooking. Is there a cookbook or two that you would recommend? You are without a doubt my favorite cooking blogger and I truly value your opinion. Thanks! I’m currently working on an Instant Pot cookbook! Look for more information about my e-cookbook coming soon. PERFECT! Send me word when it is ready. I can even be your guinea pig to try recipes if you want. Thanks! I bought the bigger 8 quart size Instant Pot. Does the cooking time change on recipes if I’m using a larger pot? It seems like most people are using a 6 quart, but I have a large family so I thought I should just get the bigger one. Thanks! If you have a bigger family, I know you’ll love the 8 quart IP – the cooking times are the same. My list of Instant Pot recipes is growing! Let me know which one you try. Do you leave the roast in and cook it the additional time when you put he veggies in? Yes, just leave the roast in and add the veggies. Have you seen my Instant Pot, Now What? post With tips and tricks for using your Instant Pot? Thank you for sharing. I’ve been using an electric pressure cooker since the early 2000’s. Tank was an early electronic version and eight quarts. Had to down-size since it is just Babe and I. Bought the 6 quart Instant Pot. Must cook for about 2-5 minutes longer depending on the meat’s thickness because Tank’s PSI was higher. We substituted sweet potatoes. I did not thicken the juice because we prefer the juice, well, juicy. Excellent recipe. Your recipe for the gravy has more flavor than mine. I think it is the addition of Balsamic vinegar. Nice touch. Take care. My parents made pot roast in the crock pot and the meat over cooked and the veggies were still firm. They want to use my instant pot to reheat the leftovers. What would be the best way to do this? Sorry to say, but if the meat is overcooked it’s not going to improve in the instant pot. The veggies can be heated by first adding water to the insert pot and then using the steam mode for about 5 minutes. Made this tonight such a wonderful recipe- so easy and delicious! I am new to the IP world, but have been very impressed so far. Can’t wait to try more of your recipes! You’re welcome and i’m so glad you like this recipe! I’m creating and adding new recipes to ABK regularly. The IP is such a handy and versatile appliance- I love it! Just made for my in-laws and family and it was a huge hit, even for my 12 yr old son. Got lots of compliments and barely any left overs, I did 45 min and 10 min natural release for 3 lbs. Also used 1 cup of beef broth, but not sure it made a difference. Cooked carrots separately but the potatoes came out perfect with the 5 minutes – soft but not mushy. Will definitely make again. Thanks for the recipe! I am using my Instant Pot more and more and loving it! Thanks for your positive feedback on this recipe. I’m always glad when a entire family gives my recipe a thumbs up! Loved how tender and delicious this was! I made it with your lion house rolls which turned out divine! I want to prepare your pot roast recipe, however, I will will have to cook it in the morning (due to scheduling conflicts) and serve it in the evening. How would you suggest I go about properly reheating while maintaining the flavor, etc.? There is a keep warm feature that works for up to 10 hours on most IP models, if you don’t want to use it, just refrigerate and then place back in the IP later in the day and place on the saute mode to heat up and then the keep warm mode once it’s warm. Or you could heat up in the oven at about 300 for an hour! I have been intimidated by my instant pot, so thankyou for the great directions! I am making this for the second time tonight because it was such a hit with my family! I am so excited that I finally made a roast that was moist! I have made so many dry roasts I swore I was never going to make one again. Glad I gave the instant pot a try. Highly recommend this recipe! Thanks so much for your feedback! I agree, the IP makes the best pot roast. I made a pot pie with the leftovers last week! I’m excited to try this! How do you think flank would do with this? I know I’ve tried flank in other IP recipes and it was good. I recommend not flouring the roast before browning. Just sear the meat and cook as directed on this recipe. If bits of flour stick to the bottom of the IP, you will get a “burn error” message and the IP won’t work. You can do this! I’m proud of you for learning how to use this new appliance. You will love the convenience and delicious results. Please let me know how you liked this recipe and thank you for reading ABK. Hi! Making this tonight! When do I use the tub of Knorr? Is that just for the gravy? I can’t find the step in the instructions. Thank you! Hope you loved this dish. Hi! i’m trying this recipe tomorrow. do you think it would work to double to recipe if i have the 8qt IP? i’m needing to feed 12-14 family members. I think a double recipe should work perfectly in your 8qt Instant Pot. I hope you have a wonderful family dinner tomorrow. Hi Kimmi, I used a pot roast, but you can use a chuck or shoulder roast as well. Thanks for asking and for reading ABK! I am new to Instant Pot cooking so I tried Si’s recipe first thing because I knew it would turn out. This is the best pot roast I have made in 20 years. I’ve made them regularly for Sunday dinners in my crock pot and they have been a favorite. But this version was seriously amazing. I also made the gravy and it was delicious too. I cut up Yukon gold potatoes, onions, and carrots and they only took 5 minutes to cook. They looked like they were out of a magazine. We had this meal for Sunday dinner. Then I put the leftovers in a pot in my fridge. The leftovers made dinner for another night during the busy week and it was just as delicious. My family is already requesting this meal for another time soon. Thanks Si!! So glad you loved this recipe! It is one of my most requested recipes when our kids are in town! Thanks for your thoughtful comment Emily! I am going to make this over the weekend but haven’t been able to find a store that has the Knorr concentrated beef stock; what can I use instead? Hi Sherri, you can use any other brand of flavor booster, like Swanson or Accent. Hope this helps and thanks for asking! I have found it consistently at Walmart of all places! Target also carries it sometimes. You may use any other brand of bullion or liquid concentrated stock such as better than bullion! This the first recipe that made me happy about buying my instapot! So easy, fast and delicious. I’m about to make it again, but i was wondering if you think it’ll freeze well? I’m super pregnant and want to leave some meals in the freezer for my kids when I’m in the hospital. I should have looked at your recipe before trying this for the first time. I just quickly googled one and the other recipe didn’t say to do the natural release. I ended up with hunk of meat as hard as a rock haha! Will def try again with yours. Can this be done with 2 roasts equalling 5 lbs?? Yes, it can, thanks for asking Chelsey!